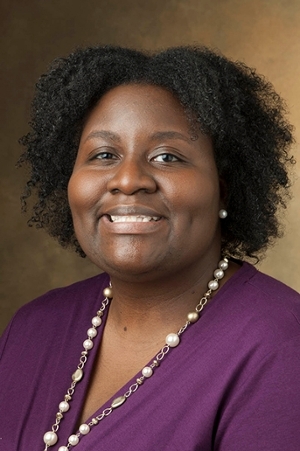 Jessica Harris, PhD, associate professor in the Department of Historical Studies within Southern Illinois University Edwardsville’s College of Arts and Sciences, has been named to the Penn Center for Minority Serving Institutions’ (CMSI) inaugural Aspiring Leaders Forum and Mentoring Program. Harris, who has been at SIUE since 2011, is one of 21 educators selected from colleges and universities from across the country to participate in the two-year program, whose end goal is to cultivate future Minority Serving Institution (MSI) college presidents. Harris is a Diversity Faculty Fellow in the Office of the Provost and Vice Chancellor for Academic Affairs and was named to a three-year term as Director of the SIUE Black Studies Program in July. CMSI developed the MSI Aspiring Leaders Forum and Mentoring Program to allow prominent Minority Serving Institutions’ (MSI) leaders to engage with mid-career aspiring leaders from the education, non-profit, and business sectors in an effort to prepare the next generation of MSI presidents. The program will kick off with a three-day forum from Nov. 17-19 at the University of Pennsylvania in Philadelphia. Afterwards, each aspiring leader will be paired with a past or current president of a minority serving institution. “I want to be a president of an HBCU someday and participating in this program will set me on that course,” said Harris, who received a bachelor’s in history from Dillard University, a private HBCU in New Orleans. She then went on to receive a master’s and PhD in history from Cornell University in Ithaca, N.Y. However, right now, the history professor is focused on SIUE. “I want to use my knowledge and experiences to contribute to making this institution all it can be. Everything that I do is to push the mission of this University forward,” added Harris. “When I consider the mission and values of SIUE, students are my central focus. Students are important. They come first for me, and I do my best to respond to their needs and concerns. “For instance, my colleague, Dr. Bryan Jack, and I proposed the idea to bring the Sustained Dialogue program to SIUE, in response to students saying they wanted to have meaningful and often times difficult conversations about issues related to diversity and inclusion,” she said. “I will continue to work with others to develop initiatives and programs to let students know they have been heard, and for them to have new experiences in and outside of the classrooms.” Jack is an associate professor in the Department of Historical Studies. Read more about the MCI Aspiring Leaders. The Penn Center for Minority Serving Institutions brings together researchers and practitioners from Historically Black Colleges and Universities, Tribal Colleges and Universities, Hispanic Serving Institutions, and Asian American, Native American, and Pacific Islander Serving Institutions. CMSI’s goals include: elevating the educational contributions of MSIs; ensuring that they are a part of national conversations; bringing awareness to the vital role MSIs play in the nation’s economic development; increasing the rigorous scholarship of MSIs; connecting MSIs’ academic and administrative leadership to promote reform initiatives; and strengthening efforts to close educational achievement gaps among disadvantaged communities. The Penn Center for Minority Serving Institutions is part of the Graduate School of Education at the University of Pennsylvania. For further information about CMSI, please visit gse.upenn.edu/cmsi.